Sunlight touching our skin helps to manufacture vitman D in the body. Brief and causal exposure of the face, arms and hands to sunlight is thought equal about 200 I U Vitamin D (5mg), and prolonged exposure may equal vitamin D at a level of 10000 IU (250mg) daily. UI traviolet light penetration depends on the amount of melanin (coloring pigment) present in the skin ( darker the skin, lesser the penetration), clothing, blockage of effective rays by window glass and the use of sunscreens. 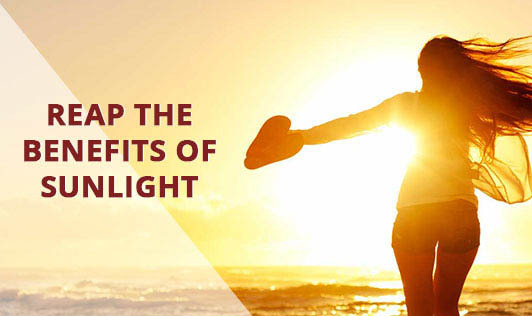 Sunlight is believed to reduce symptoms of depression, fatigue, insomnia and some cases of dermatitis. Melatonin, an essential hormone for sleep, normally increases in production at night and decreases by morning. Melatonin also depends on sunlight for production. Depression is associated with low melatonin levels, and this is especially the case with people who become depressed during the shorter days of winter. Long indoor-working hours, artificial lights, shift work, etc alters the biorhythm and reduces the production of melatonin. At least 20 to 30 minutes of early morning or late evening sunlight would will help. • Open your windows in the morning and evening. • Practice surya namaskar regularly. It is an excellent exercise.